Nowhere Like Queensland: That was then, and this is FAB! 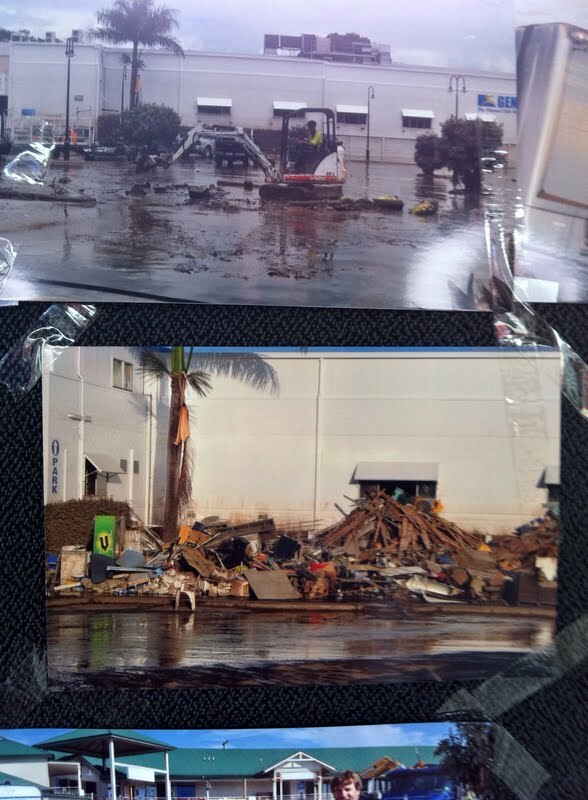 It was the aftermath of the January 2011 floods, which left much of Brisbane (and let's face it Queensland and other parts of the country), inundated with stinky, sludgy floodwater. I blogged at the time, that it was the closest thing I'd ever come to living in a war zone. People were left homeless and stranded. Property and businesses were destroyed, basic requirements like clothes, family photographs, and personal records were gone forever. Not to mention the loss of food, water, electricity, lives. By the Grace of God, I was safe. I'd moved weeks earlier, in a bid to escape a neighbourhood thug who was bullying Mr 10. The thug and his gang were well-known to police, but because of their age, the police could do little more than tell them off and slap their wrists. (Although the main bully did receive a caution, which I'm told goes on his permanant record if he offends as an adult). After that, the bullies would often congregate at the park across the road, which ironically, I'd taken as a bonus when we took the rental. And they would shout abuse at the kids, but run away when I took them to task, and yell sexual slurs at me. They damaged my car and letterbox, and would knock on the door and run away. Little arses, and I can't tell you what I think of their parents. Anyway, that's a whole other story. Moving was an absolute and expensive pain in the arse at the time, but a necessary means to an end. And as it happened, that nasty, evil bully and his gang of thugs saved my little family from losing everything. Our 'new' home was situated at the top of a steep driveaway, near the top of a hill. Around us, we were isolated by stinking floodwaters, but we were safe. And dry. I found out later that our old home, street, community centre, and neighbourhood, went completely under. Residents were evacuated, and many lost precious belongings. We were stranded away from home for a while (as we'd been visiting family when the floods hit), and we lost power and water too. But the damage was minimal. I did my own part to help those who weren't so lucky. I provided what I could spare of clothes, bedding, towels, and toys for those who had lost everything. I spent hours buying bottled water and giving it away to the Mud Army of volunteers. I'm not special. Everyone did what they could. The community spirit was alive. And slowly, life returned to normal. When I think back to that time, I remember that bad things can happen to good people. But good people can help to make bad things better. And so came the re-opening of the All Sports Shopping Centre at Jindalee. Thanks, not just to the business people who lost everything during the floods, but the generous souls who lived and worked in the area, this vibrant little village is now open for business. Bigger and better than ever before. All Sports was home of the real estate agency from whom I purchased our family home; a home the kids and I loved. Later, when my ex's work took us overseas, they found us tenants for that home. And later, sold it, because we were going to return and buy a cool new one. Anyway, that house was more than a house, but a home. And it survived the floods, just, so my lovely former neighbours told me. Nearby Jindalee Allsports was where our favourite GPs worked, and our favourite blood-taking, urine-sampling, clinic resided. Where we got videos, and loaves of fresh bread. Milk and the occasional pie or sausage roll for the kids. And those silly marshmallow ice-cream cones. For when they had been Really Good At The Doctors' Surgery. (Read: When they had not run screaming up and down the aisle in fear of needles, vomited all over the waiting room, and/or told the doctor that Daddy was very well thank you, but farted a lot). And suddenly, in January 2011, the surgery, the shops, the vampire blood collecting place, were all gone. The Nook Caffe-Restaurant, which I'll be reviewing soon. And which has already worked itself into the tummies of residents in the Western Suburbs. ﻿The kids were not keen to be photographed with the Pizza Capers dude/dudette. So I had to do it. (NB: This did not stop them from scoffing huge amounts of pizza. Also? I think they have a secret agenda to see their Mumma look silly). 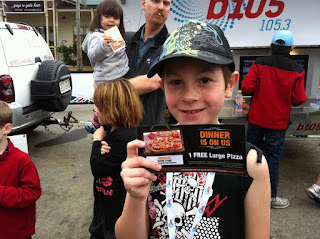 Mr 10 was thrilled to win a prize from Pizza Capers and B105 FM - a large pizza for all of us! Oof! On the jumping castle. Thankfully, pre-pizza-eating! While Miss 8 took advantage of the free face-painting to become a cat! Thanks to the very kind people of Pizza Capers at All Sports Jindalee - who were kept busy on the re-opening day handing out delicious free pizza - I have a giveaway for people who live in the area. and for the larger (or hungrier) family, a voucher for one free large pizza and three kids' pizzas. To enter, make sure you're following Nowhere Like Queensland, and leave a comment below. Unfortunately, these prizes are only valid for the Jindalee Pizza Capers store, but there is talk of a nationwide giveaway on my sister blog Maid In Australia. WOW we missed a wonderful day by the looks of it. What a shame SUPER GLAD you guys had a wonderful time.. C and H Looked like they had a ball.. So glad the doctors are open again nothing like a familiar face to help when in need and the chemist and the blood takers and the movie shop and cant wait to try The Nook sooo glad all these places are bouncing back after the terriable floods. Shame we missed such a lovely local celebration though glad you guys had so much fun. Isn't it interesting how things unfold? Sounds like a great day at the re-opening! Great work :) Looks like you've put a lot of effort in. Amazing the progress and changes that have been made around the western suburbs since the floods. It's looking great around here! Thanks for your comments people. Winners are Leanne and Spikko. Please contact me so I can send you your prizes.